The 1-2 day delivery service fee (formerly listed as overnight delivery fee) will increase from $15.89 to 16.48, effective Monday, January 28, 2019. Updated DS-1832 (Non-Postal Passport Application Transmittal) reflecting the new 1-2 Day Delivery Service Fee of $16.48. Parents must provide a car seat for all infants taking a passport photo. Passport applicants (including both parents of minor applicants) must be present in the passport office no later than 3:30 p.m. for processing. Passport photos can be taken on site at the County Clerk’s Office. The Federal Government does not accept starter checks for the U.S. Department of State payment portion. No credit/debit cards are accepted. As of April 2011, the Department of State requires that birth certificates reflect the applicant’s parental information, regardless of the applicant’s age. All birth certificates issued by “Hudson County Vital Statistics” must be replaced with a birth certificate issued by the State of New Jersey’s Department of Vital Statistics. All applicants must appear in person at the time of application. NOTE: *If applicant has changed his/her name from what it says on any items proving citizenship, but has not changed the name on his/her primary ID, then applicant must provide an original marriage license or court order name change documentation with his or her proof of citizenship. NOTE: **A certified birth certificate has a registrar’s raised, embossed, impressed or multicolored seal, registrar’s signature, and the date the certificate was filed with the registrar’s office, which must be within 1 year of your birth. As of April 2011, the Department of State requires that birth certificates reflect the applicant’s parental information – regardless of the applicant’s age. Notice: The Passport Application Fee is a non-refundable processing fee and is retained by the Department of State whether or not the passport is issued. A Passport Card can only be use for land and sea travel; it can not be used for airline flights, regardless of the destination. This service is only available for Passport Book applications. 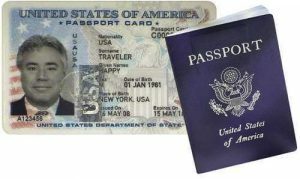 A FILE SEARCH (add $150) can be performed, if you were issued a U. S. Passport and have since lost the passport and any additional proof of citizenship (see above), but wish to re-apply for a U. S. Passport. During this process, the federal government will search their records for the initial proof of your citizenship that was submitted and will then either approve or reject your application based on their findings.